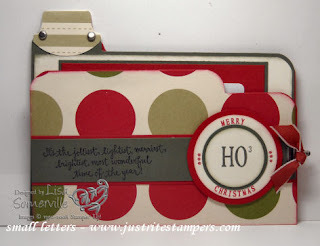 Designs by Lisa Somerville: Christmas File Folder - done JustRite! Christmas File Folder - done JustRite! Can you tell I'm having fun with my JustRite Stampers! Here's a file folder card (click photo eo enlarge) I created using my JustRite Small Letter Set and monograms to create my HO HO HO, Merry Christmas. The tab on the folder would be great for personalization too - I'll add that when I'm ready to give this at Christmas! The file folder is held closed with a Small Library Clip, the notch on the clip was perfect for adding a piece of Riding Hood Red Taffeta Ribbon. The sentiment used on the file folder is from Jolliest Time of the Year, the DSP is last years Dashing - just loved this paper! 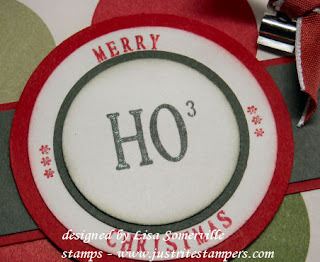 Here's a close up of the JustRite Stampers medallion - I used my Spica Glitter Pens to go over the letters to give them some shimmer. 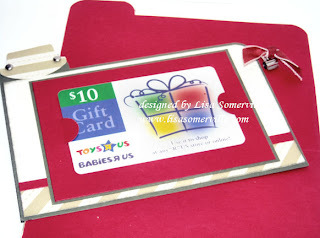 Here's what the inside looks like - I used my slit punch to create notches to hold my gift card in place. Don't forget voting ends Monday evening at 9:00 Eastern Time for this weeks JustRite Champion Contest - head over there to vote. While you're there be sure to enter one of your JustRite Creations in this weeks contest! The file folder directions can be found here on Beate's Blog. Fantabulous! You are killing me with the JustRite Stamper! I *had* no interest in it.